HARARE, Zimbabwe -- South Africa's president, Thabo Mbeki, presented a plan to Zimbabwe's political leaders Sunday that would allow Robert Mugabe to remain as a titular head of state but surrender real power to the opposition leader, Morgan Tsvangirai, who would serve as prime minister until a new constitution was negotiated and fresh elections held. A senior official of the opposition Movement for Democratic Change, who has read the document, told The Guardian that Mbeki had sent the plan to Mugabe and Tsvangirai and that it was generally welcomed by the MDC. The opposition believes the proposal appears to represent a recognition by Mbeki -- whom Tsvangirai had previously accused of "colluding with Mugabe to play down the deepening political crisis" -- that the Zimbabwean president's power is crumbling. But the MDC remains suspicious of Mbeki and is demanding that the African Union be a party to any deal to ensure it is adhered to. The proposal nonetheless adds to growing international pressure on Mugabe, who has said that while he is prepared to talk to the opposition, it must first recognize that he is the legitimately elected president and will remain so. Mbeki's spokesman, Mukoni Ratshitanga, said he could neither confirm nor deny that such a document exists [There was no word on Mugabe's reaction to the Mbeki proposal]. Meanwhile, Nigeria became the latest African government to condemn last month's presidential election, in which Mugabe claimed 90 percent of the valid votes after a military-led campaign of violence against the opposition. In Japan, leaders of the Group of Eight richest industrialized countries are expected to consider taking "measures" against Zimbabwe, according to the host of this week's summit, the Japanese prime minister, Yasuo Fukuda. An American official said Washington expected the G-8 to "strongly question the legitimacy of [Mugabe's] government." The British foreign secretary, David Miliband, speaking to reporters after meeting Zimbabwean refugees in Johannesburg, said Sunday the crisis in their country was "infecting the whole" of southern Africa. "No one who meets the people here could do anything other than redouble their efforts to secure international consensus that the Mugabe regime is not a legitimate representation of the will of the people of Zimbabwe," he said. Miliband called for international backing for a U.S. proposal at the United Nations Security Council that calls for sanctions against Zimbabwe's leaders. The senior MDC official, who spoke on condition of anonymity, told The Guardian the party leadership found itself in surprising agreement with much of what Mbeki was proposing, describing it as an important shift from what the opposition described as his previous positions aimed at propping up Mugabe. The official said "all the basic ideas of the MDC are there," including a recognition of the results of the first round of elections in March won by Tsvangirai. That would be met by making the MDC leader an executive prime minister. "The important thing is that it recognizes the outcome of the March 29 election, and that any government will be transitional on the way to new elections," the MDC official said, adding that the opposition recognized it would have to make concessions and that allowing Mugabe to remain as president was acceptable if it laid the ground for a new constitution and a fresh vote. But there are important areas of difference between the MDC and Mbeki, particularly an MDC demand for an African Union mediator to work with the South African leader, and for the AU to act as a guarantor of any agreement. There have yet to be formal negotiations on the proposal. 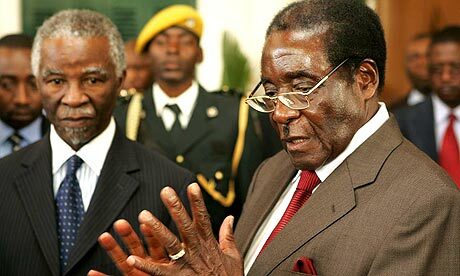 Mbeki flew to Harare on Saturday for a meeting requested by Tsvangirai. But the MDC leader pulled out when, according to the opposition, he was called on short notice by the South Africans to a meeting with Mbeki and Mugabe at the State House, the presidential offices in Harare. Tsvangirai was concerned that going to the State House would be seen as conferring recognition on Mugabe as the legitimately elected president. The MDC also feared that such a meeting would be used by Mbeki to persuade AU and G-8 leaders that he was on top of the crisis and there was no need for further international pressure or intervention. Some of the opposition's fears proved founded when the leader of a breakaway MDC faction, Arthur Mutambara, was invited to the meeting and pictured on the front page of the state-controlled Herald on Sunday smiling and shaking hands with Mugabe. Mutambara holds the balance of power in the newly elected parliament. He had previously said his MPs would back Tsvangirai, but there is clearly a concerted effort by the government to get him to side with Mugabe's ruling ZANU-PF party. The Mbeki proposal is similar to a power-sharing agreement reached in February that ended weeks of bloodshed in Kenya following a disputed presidential election last December. President Mwai Kibaki and opposition leader Raila Odinga signed the landmark agreement, which was brokered by former UN Secretary General Kofi Annan. Under the "Kenya Compromise," Kibaki remained president, but ceded some of his powers to Odinga in the newly-created post of prime minister. The agreement also gave Odinga's party, the Orange Democratic Movement, about half of the cabinet seats in a government of national unity. The agreement brought an end to weeks of ethnic and political violence in which more than 1,500 Kenyans were killed and 600,000 were displaced following a disputed presidential election on December 27 that saw Kibaki claim a re-election victory that the opposition denounced as rigged. Until the agreement was announced on February 28, there was little sign that Kibaki was willing to accommodate the ODM. With reports that militia groups allied to both the government and opposition were stockpiling arms, many Kenyans were preparing for the worst. Instead, they saw Kibaki and Odinga shake hands vigorously in front of a large assembly of Kenyan parliamentarians and diplomats, smile for the television cameras, and talk about reconciliation and unity. Meanwhile, in Japan, leaders of the G-8 came under pressure Monday to live up to pledges to help Africa as they opened a summit dominated by skyrocketing oil and food prices. The G-8 leaders, including President Bush, gathered in the secluded spa resort of Toyako in northern Japan for their three-day annual session, with eight African leaders joining the first day to take up the plight of the continent. Protesters were being kept at bay in a specially designated camping area on the opposite side of sapphire-blue Lake Toya, away from the plush hilltop hotel where the world's most powerful leaders were gathering. The G-8 was joined for Monday's so-called outreach session on Africa by the leaders of Algeria, Ethiopia, Ghana, Nigeria, Senegal, South Africa, Tanzania and the head of the African Union. The AU, at its summit in Egypt last week, ratcheted up pressure on G-8 leaders to live up to the pledges made at their 2005 summit in Gleneagles, Britain. The club of eight of the world's richest nations in 2005 promised to boost aid to Africa by a further $25 billion by 2010. But UN and AU figures indicate that only less than a quarter of that amount has been forthcoming and aid groups said that some of the G-8 nations -- Britain, Canada, France, Germany, Italy, Japan, Russia and the United States -- were walking away from earlier commitments. Special Report Copyright 2008, Guardian News and Media Ltd.